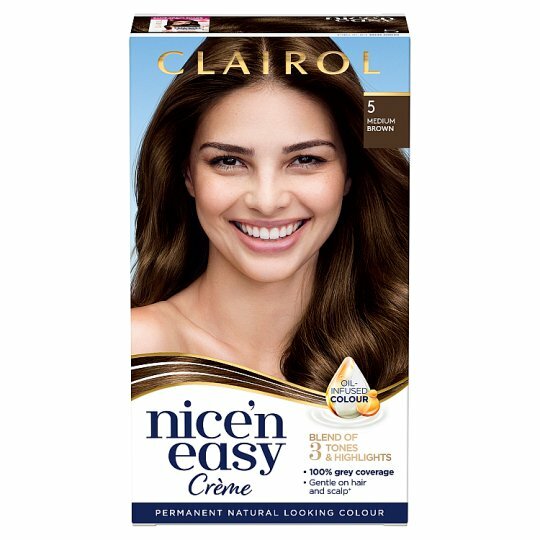 Clairol Nice'n Easy permanent hair colour crème gives you the nicest and easiest way to refresh your look from the comfort of your own home. 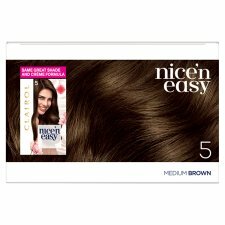 If you want to enhance the colour of your hair and make sure it stays perfectly true to you, Nice'n Easy Permanent Hair Dye 5 Medium Brown, delivers brilliant natural-looking colour. Our breakthrough hair colour crème has conditioners built into every step, ensuring that hair maintains its soft, silky, smooth feel throughout the colouring process. In addition to phenomenal colour results, the colour care formula offers an upgraded colour experience with a non-drip colour crème that smells like flowers, not ammonia. 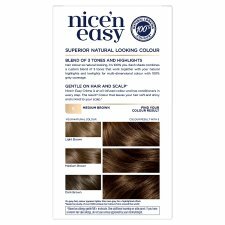 Our revolutionary hair dye gives you 100% grey coverage with real natural-looking tones & highlights while being kind to your hair. Plus, being allergy gentle, significantly reduces the chance of developing an allergy* (*in people without a hair dye allergy). With Clairol Nice'n Easy permanent colouring crème you get the colour that cares for your hair without compromising on colour result. 5. Leave the colour mixture on the new root growth area for 20 minutes. This product contains ingredients that may cause skin irritation on certain individuals. Perform an allergy alert test 48 hours before each time you colour even if you have already used colouring products before. BUY THE PRODUCT 48 HOURS IN ADVANCE AND CONDUCT AN ALLERGY ALERT TEST EVERY TIME YOU COLOUR EVEN IF YOU HAVE USED COLOURING PRODUCTS BEFORE. If you have a known hair dye allergy, do not use this product unless approved by your dermatologist. Read and follow enclosed instructions. CAUTION: This product contains ingredients that may cause skin irritation on certain individuals and a preliminary test according to accompanying directions should first be made. This product must not be used for dyeing the eyelashes or eyebrows. To do so may cause blindness. Hair colourants can cause severe allergic reactions. Temporary "black henna" tattoos may increase your risk. Do not use on persons under the age of 16. Do not use if you have: - a rash on your face or sensitive, irritated or damaged scalp, - ever experienced any skin reaction after colouring your hair or after a "henna" tattoo. In case of any reaction or if in doubt, consult a doctor before using this product. Rinse well after application. Avoid any contact with eyes, rinse immediately if product comes into contact with them. Wear suitable gloves. Keep out of reach of children.